Gcash is a safe cashless transaction that works like a credit card, except that you need to preload it with your desired spending budget. Funding your GCash mobile wallet is also easy because there are more than 10,000 accredited GCash Outlets: Globe Stores, SM Business Centers, Puregold Supermarket, and Tambunting and Cebuana Lhuillier pawnshops. 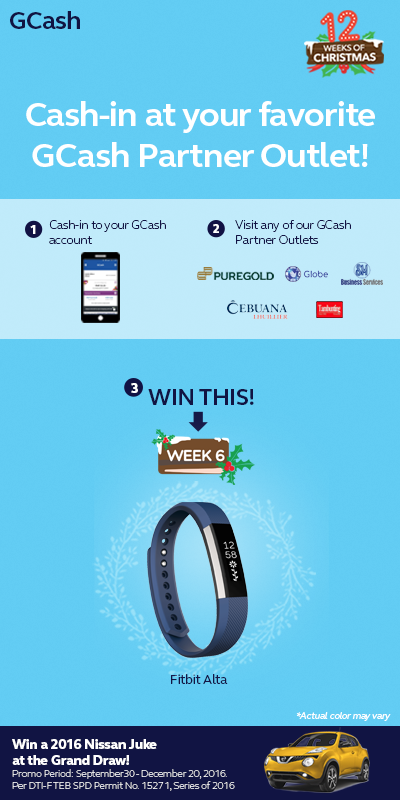 For every transaction between November 4-10 entitles you to a raffle entry and get a chance to win a Fitbit Alta for the 6th week of GCash Christmas Promo. Fitbit Alta is a fitness wristband which you can personalize to fit your activities such as step count, calories burned, etc. Every week leading to Christmas, we will be giving out gifts to our GCash customers as they accomplish certain GCash tasks. To qualify for the November 4 – November 10 promo, a GCash customer must successfully cash-in at their favorite GCash Partner Outlet to earn one (1) raffle entry. This week’s raffle draw is on November 11.